Sue Falsone ‘dissects’ the scapular stabilizers and includes why she believes they should first be looked at from a mobility viewpoint. The other group of muscles that are very important when we talk about the shoulder is something we call the scapular stabilizers. When we talk about the scapular stabilizers, that’s a bit of a misnomer. Nothing about the scapula is truly meant to be stable. If the scapula were meant to be stable, it would have a much better bony connec­tion, but it doesn’t have a great bony connection to the body. It has an incredibly expansive muscular connection to the body. When we talk about the scapula, we need to think of it in terms of controlled mobility—not necessarily stability. I use the term, “scapular stability,” as that’s a term we all commonly use, but I want you to think about it as really controlled mobility. The muscles in this area that focus on controlled mobility of the scapula include the trapezius, specifically the lower trapezius muscle, which lies right around here. We also have the middle trapezius and the upper trapezius. This is really all one big, fan-shaped muscle with fibers coming in different directions. The trapezius is an extremely important muscle group when we’re talking about the shoulder. We also have the rhomboids. The rhomboids lay in this direction, attaching themselves onto the medial border of the scapula right to the center of the spine. Another really important muscle for us when we look at the shoulder is the serratus anterior. That serratus actually attaches underneath the scapula, attaches onto the medial border here, runs under­neath between the shoulder blade and the ribcage, and attaches down here onto the ribs. The serratus anterior is such an important muscle because it is what keeps the scapula attached to the thorax, so this thing doesn’t come winging out. You can see here Lindsay gets a little bit of medial bor­der winging. Often when we see this compensation of medial border winging, it’s because the serratus anterior may not be working properly. The serratus anterior is really what keeps this shoulder blade flat against the thorax. Along with the serratus anterior, we have the rotator cuff. Everybody has heard of the rotator cuff. Keep in mind this group is really four different muscles. The rotator cuff is made up of the teres minor, which is right around here. We’ve got the infraspinatus, the supraspinatus and we’ve got the subscapularis up front. These four muscles work together to externally rotate and internally rotate the shoulder. Yes, they definitely do that. However, as a group, these four muscles really work well to­gether in order to centrate the humeral head. Learn how to identify possible issues in the shoulder so you can stop shoulder injuries before they happen. 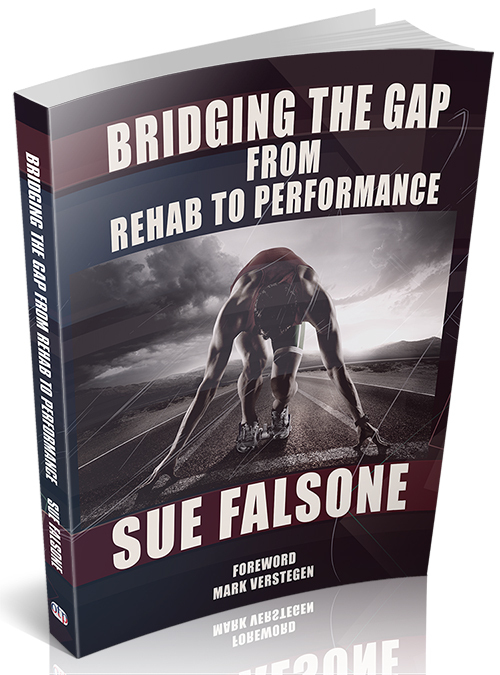 If you are interested in Sue’s work with athletes, you can learn more in her book, Bridging the Gap from Rehab to Performance.